A stylish way to protect scissors from damage or contact with water. The Sibel Hedgehog Scissor Holder employs a nest of densely-packed, thin nylon bristles to hold your hairdressing scissors when you're not using them. 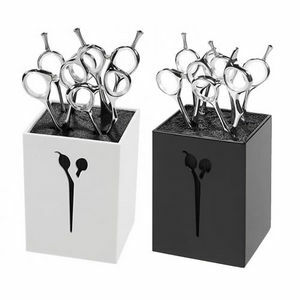 The Holder can easily accommodate 4 pairs of scissors. The bristles are housed in a stylish choice of all-black or black and white casings and either will look great in any salon. £16.79 (inc. VAT) Why no VAT? We're a trade wholesaler and quote our prices without VAT to help our VAT-registered customers understand the true cost of a purchase.